Take a look at the world's first 88 inch 8K TV. LG is pushing TV displays to ever-greater sizes and resolutions (and, most likely, prices) for the upcoming CES 2018. Engadget writes that the company will be showing off a new 88-inch OLED television with an 8K display, promising the biggest and highest-resolution OLED on the market. (You can get non-OLED 8K displays in much larger sizes.) 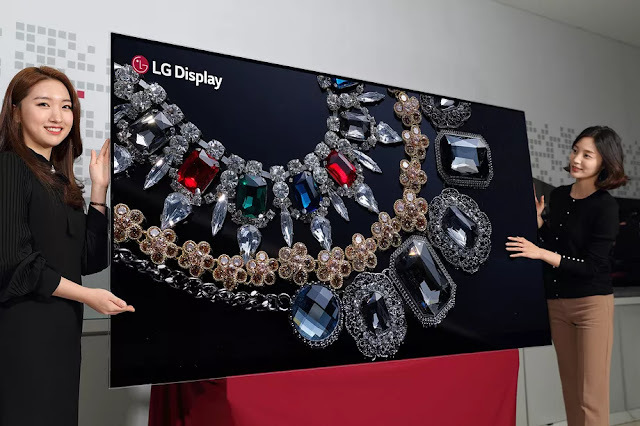 It’s an upgrade over LG’s existing 77-inch panel with 4K resolution, and although there’s no price for this new display, the 77-inch screen costs $20,000 right now. Samsung has an 88-inch TV based its competing QLED technology — also for $20,000 — but that’s also “only” 4K, and QLED’s quality is debatable. 4K OLED screens are getting more affordable, and 4K content is getting more common. But it’s still hardly the norm for TVs, so you really don’t need to be thinking about making the switch to 8K resolution right now. Even so, CES is a chance to see companies push the limits of how big, crisp, and beautiful a screen can look — and this is an early glimpse of what we’ll be seeing next week.